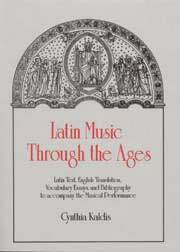 Latin text, English translation, vocabulary, essays, and bibliography to accompany the musical performance. This is also the libretto for audio-CD listening. These arrangements come from all periods of music, from 12th century Hildegard of Bingen to such 20th-century luminaries as Pablo Casals and Francis Poulenc.